Yesterday morning we woke up in Jamaica after a night of eating grilled lobster, curried goat, and ackee. We swam out to the bar (which opens at 6:00 AM) and ordered drinks. If one is lead to believe that all of Jamaica is like the resort we are at (if one is a fool) then one would assume there are not any clocks in Jamaica. 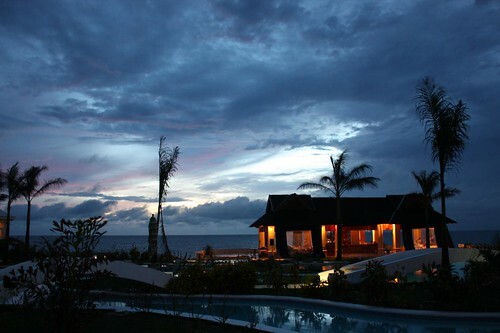 We became fond of saying that we were "on island time." This became my go to answer for anything. "Hey, Nate, why did you burn down my house?" "Hey, we're on island time." See, you can't argue with that. This morning we woke up in a much more dreary New York after a night of eating terrible airport pretzels and a 1:00 AM batch of ravioli before passing out. In chatting with a few of the Jamaican chefs at the resort I got some pretty good tips for some Jamaican cooking that I'm greatly looking forward to putting into practice. However, having had four days of all you can eat/drink hospitality it is nice to return home and make something a little lighter to eat than curried goat and oxtail. 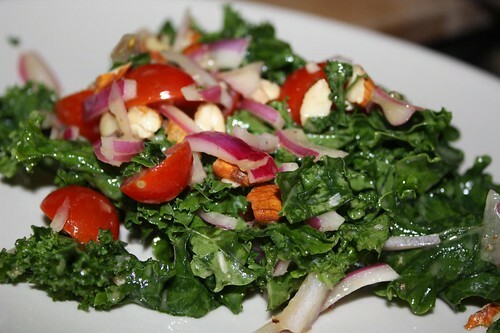 For salad we return to kale with red onion, grape tomato, and a dressing of mustard, Lyle's golden syrup, sherry vinegar, lemon juice, and olive oil. 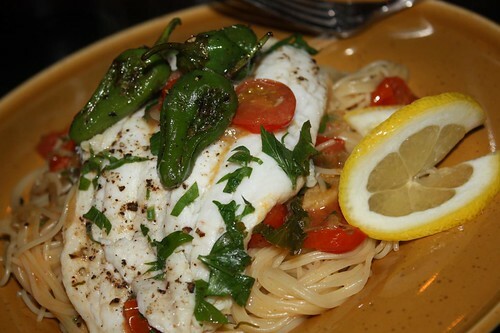 The fish market had some great-looking Dover sole on special so I picked up a pound which I cooked with a tiny bit of butter and olive oil, garlic, shallot, grape tomato, lemon, white wine, and parsley. I made a generous amount of sauce which I tossed with some cooked cappellini. For good measure I topped the dish off with some Pimiento de Padrón that I threw into a hot pan for a few minutes. They'd held up very well in the nine days in the fridge since we picked them up. They are delicious but approximately one in ten are face-blisteringly hot. The remaining nine out of ten are quite enjoyable once the sensation returns to your tongue. For wine we enjoyed the same wine I used to make the pasta sauce which we acquired on our wine tour of Michigan last summer. 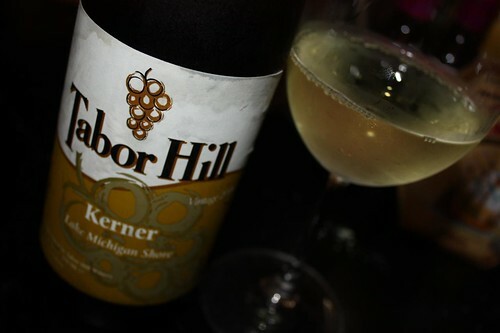 It was a kerner from Tabor Hill. The temptation was strong to enjoy one of the rum cakes we got in Jamaica for dessert, however, I feel it is more important to save that for an upcoming Jamaican night. So instead we had our usual dessert of yogurt, granola, and whatever chocolates could be scrounged up. 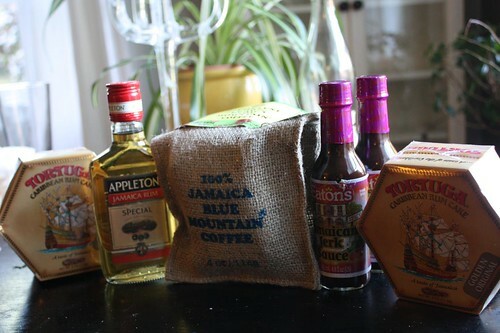 Jamaican night is going to be so awesome.